Private 8571 Charles Scouse, 2nd Battalion, Royal Berkshire Regiment. Charles was born in Headley, Hampshire, in 1891 the son of James Scouse and his wife Rose Louisa (née Bacon). He was the fourth of his parents’ eight children; his siblings being William Daniel (born 1881), Ethel Mary (1884), Albert Edward (1887), Henry, (1889), Charles (1891), George (1894), Daisy Emily (1897) and Ella (1900). James Scouse was a bricklayer, while the family moved around they did not go far from his home village of Headley. The first two children were born in Bracknell (not far from Rose’s roots in Ruscombe), the next three in Headley. George was born in Marsh Benham and the last two girls in Newbury. This pair of semi-detached houses in Cromwell Rad (12 & 14) were 1 & 2 Malverleys. It is not known which housed the Scouses. 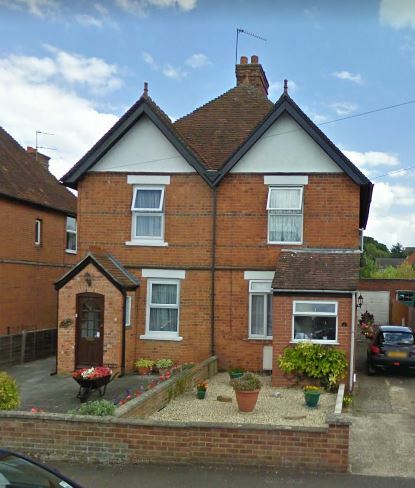 The family had settled in Newbury by 1895 and were living at 16 Westbourne Terrace in Speenhamland. In 1906 they moved to Rose Cottage, Donnington Square. Those familiar with Newbury will recognise this as a rather grand address though, in reality, it was far from it. Rose Cottage was one of a set of three small cottages tucked away behind the grand houses in the Square at the north-west corner. In the 1950s they were condemned - even then there was no running water. In 1912 the Scouses moved again, to a recently closed beer house (the Gardeners’ Arms) renamed as Ivy Cottage. ; they were not there long, by 1914 they had moved on to an unknown address. By the time (early 1920s) the Imperial War Graves Commission was in contact with them regarding Charles’ headstone James and Rose were living at Malverleys, Cromwell Road, Shaw Fields. This was a considerable improvement on their earlier accommodation. Charles was educated at Speenhamland School after which, aged around thirteen he would have entered the working world. Whatever work he found it evidently did not encourage him to settle in a trade or occupation, instead he joined the army. When war broke out in August 1914 he was serving with the 1st Battalion, Royal Berkshire Regiment at Aldershot - where I Corps was based under the command of Sir Douglas Haig. This was half of the rapid deployment force maintained in the UK for use wherever needed. The concept was developed to respond to problems in the Empire but the declaration of war on Germany meant that the entire British Expeditionary Force (BEF) would be sent immediately to France under the command of Sir John French. Each Corps consisted of two Divisions, each Division of three Brigades, and each Brigade was made up of four infantry Battalions and associated artillery and support units (engineering, medical, logistic, etc). The 1st Royal Berks was a battalion within 6th Brigade, 2nd Division. The various units at Aldershot were rapidly brought up to full strength by mobilising reserve troops and crossed the Channel less than a fortnight after the declaration of war. Charles made the Channel crossing with his battalion on 13 August 1914. Charles remained with the battalion until he was wounded at Festubert, reportedly in October 1915. He was brought back to England for treatment and convalescence. In April 1916 Charles was belatedly included in a casualty list compiled by the Reading Mercury newspaper. His obituary suggests that he volunteered to return to the front, but this may be fanciful – if he were fit to fight he wouldn’t need to volunteer to go back! 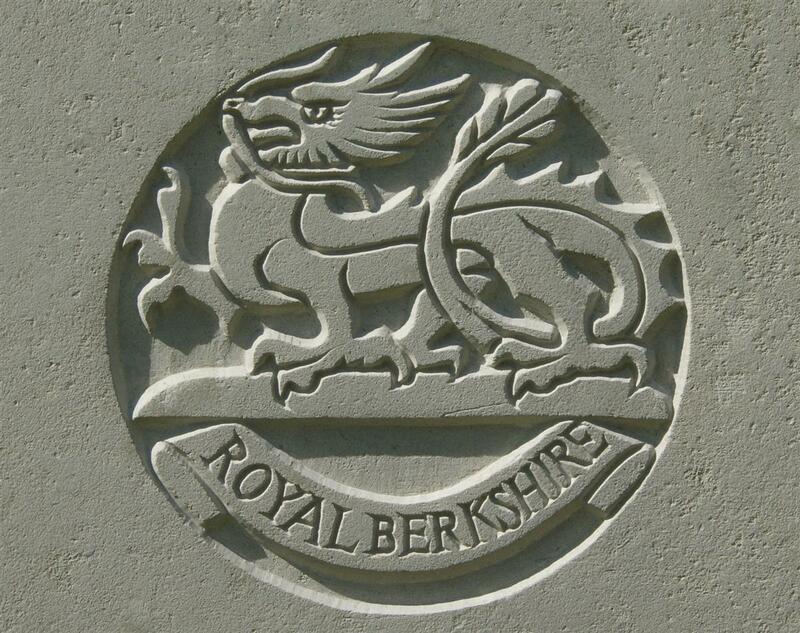 When he returned in July 1917 it was to a different battalion; the 2nd Battalion, Royal Berkshire Regiment. Men returning after treatment in the UK would be sent wher they were most needed. ‘A’ Company relieved ‘C’ Company in LEFT FRONT. ‘C’ Coy in RESERVE. Casualty 2Lt S.M. CUBBAGE Hospital. O.R. Killed 4. Died of wounds 2. Wounded 7. Sadly Charles was one of the men to die that day; the circumstances of his death were not reported – perhaps a sniper got him, but it was more likely to be a German shell – a single shell could account for all the casualties. SCOUSE – Killed in action in Flanders, on October 17th, 1917, Charles, the beloved son of James and Rose Scouse, of Malverleys, Cromwell-road, Shaw, aged 26. 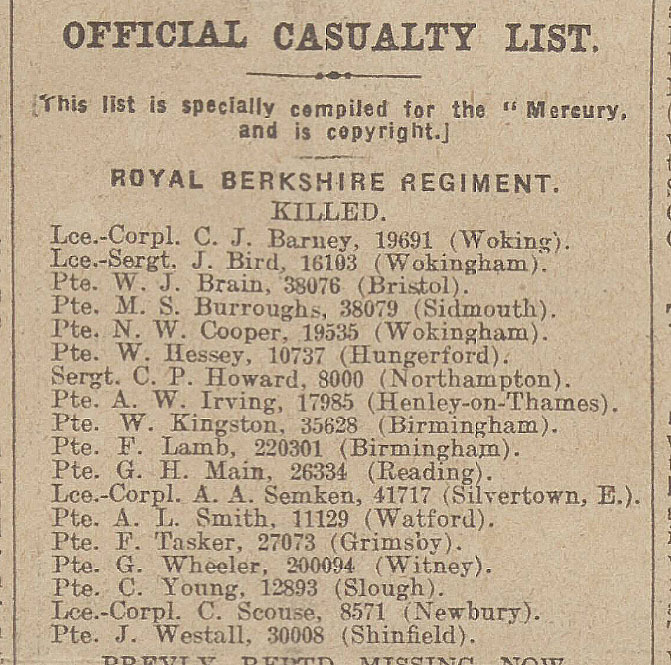 Casualty List compiled by the Reading Mercury - local papers scoured the official casualty lists for local interest. Royal Berks casualties were always reported. Few details were given, this could be a mix of men from different batalions. What it does show is that the Berkshire Regiment was not exclisuvely recruited from Berkshire! By macabre coincidence the same column also reported the death of Alan Rushent, whose family moved into Rose Cottage when the Scouses left. Charles was buried in grave III.C.21 in Prowse Point Military Cemetery 11.5km south of Ieper (Ypres) in Belgium. Graves III.C.17 to III.C.20 hold the remains of four of the other five men from his battalion who died that day; the sixth evidently made it back to a Casualty Clearing Station (a forward hospital) before succumbing to his wounds. Locally Charles is remembered on the Newbury Town War Memorial, the parish memorial for Speenhamland (the Speenhamland Shrine) and on the war memorial in Cold Ash (his parents home in Cromwell Road, Shaw was, despite the ‘Shaw’, actually in the parish of Cold Ash. 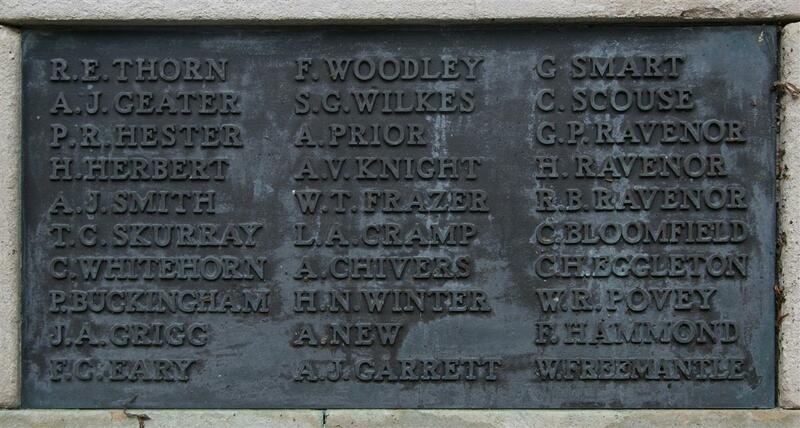 He was also remembered on the memorial placed in his old school in Speenhamland (now lost).